Google introduced Material Design as part of the latest version of Android OS: 5.0 Lollipop. Material Design is the most comprehensive design pattern library I’ve seen. The amount of detail covered and illustrating is amazing— Material Design painfully illustrates every interaction a user can have with an app, from colors to visual motion of widgets. Material Design is there to ensure that whether you are using a smartphone, tablet, laptop or smartwatch, everything is uniform and standardized, so no surprises. I think Material Design is part of the evolution of design. First, we started off with skeuomorphic design where elements were designed to look exactly like their real-life counterparts: buttons had thick shadows and gradients to make them look touchable. The upside of skeuomorphic design was that you knew what was what, buttons looked like buttons, but the downside was that designs were often cluttered as they were heavy on visual design. Flat Design was the next step, it brought a cleaner UI, which resulted in elegant-looking interfaces— the main upside. The downside of Flat Design was that it brought in bad usability because buttons didn’t look like buttons (they were just text) so it was hard to tell what was tappable/clickable. But this was generally thought to be okay because now people knew how to interact with software, skeuomophism was no longer needed. If you’d like to see more detail on Material Design, take a look at the very detailed design spec. 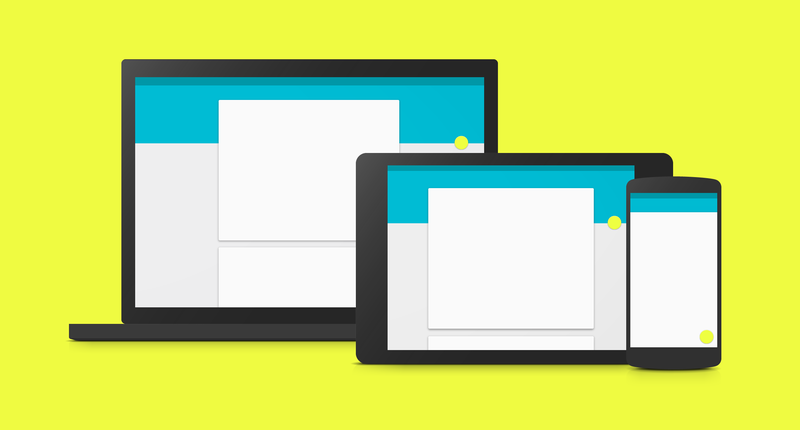 For now, let’s jump the analysis of what Material Design is going to offer. No matter what device you use, or what app you use, if you are using Lolipop you can expect elements to behave a certain way. No more wondering if the menu is going to up from this side or that side, or whether that button is really a button. This uniformity will reduce the users’ cognitive load and allow them to focus on what they are trying to get out of the app! Great! As seen in the YouTube video above and on a couple of pages in the design spec (here and here), the interactions are quite wonderful. They make clicking/tapable on a button enjoyable. It now does something! These colors are vibrant and lively. Hopefully, there’ll be no more gloomy apps, and to be sure, make sure you use the Material Design Palette Generator. Apps are going to look all the same.. Since Material Design is so thorough/detailed, I have a feeling all apps are now going to look very similar, which is going to be quite boring. I’m okay with the menu usability issue, but this is one I’m very worried about. All apps with lists will look the same. All apps that play music will look the same. Are we going to be delighted or feel special when using a certain app? Perhaps not.. So my challenge to product designers and developers is: think different and be different. Follow Material Design’s philosophy/conventions but make your app stand out. You need to make your app memorable for what it is. I believe in you, you can do it! Previous Previous post: Should Product Managers Travel? Next Next post: Why are “agencies” hiring Product Managers?